One of my favourite dishes is Oxtail stew. All over the world people prepare it differently and serve it in a variety of ways. Oxtails (when cooked correctly) are delectable, moist and full of flavour. They are meat from a cow’s tail, and can be quite tough; so they require some tender loving care and are best slow cooked for several hours. So today’s recipe is my absolute favourite Oxtail Stew. Marinate the oxtails with salt, pepper and chilli flakes. On a medium to high heat; heat one tablespoon of olive oil or vegetable oil in a large pot. Don’t over crowd the pot, brown the oxtails on each side a few at a time; then remove them from the pot and set them aside. Add the chopped onions and carrots to the pot, and cook them for a few minutes or until the onions become translucent. Add the tinned tomatoes and mix well, now add the tomato paste, and then the oxtail back to the pot; stir in the chopped garlic and the stock and ½ a teaspoon of salt, reduce the heat to low and leave to simmer – cook for 3 hours until the meat is very tender. 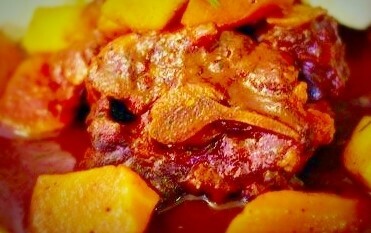 You can also cook the oxtail stew with red wine. Simply add only 475 ml of stock and 475 ml of red wine; and follow the above method. Oxtails are usually served with the bones inside; however, you can easily remove the bones from the meat before serving. They can be served with in a variety of ways; with nshima, fluffy curry rice or potatoes, and roasted vegetables like carrots and parsnips. To serve with roasted vegetables; toss together sliced parsnips and carrots in olive oil, with a sprinkle of salt and pepper. Preheat the oven to 175 ? C and roast the veggies until they are lightly brown and cooked through – for about 1 hour. 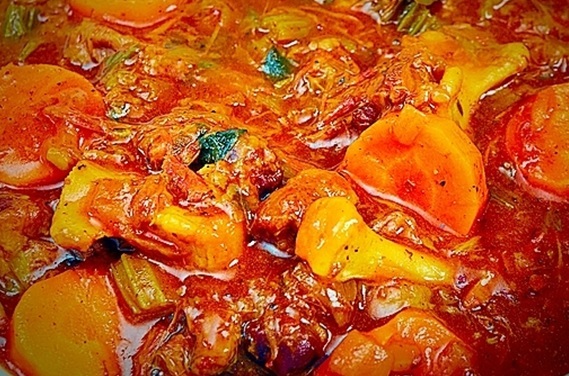 The oxtail stew shown in the main picture above has been seriously overcooked and ruined. I prefer my ox-tail roasted on an open fire or just fried!